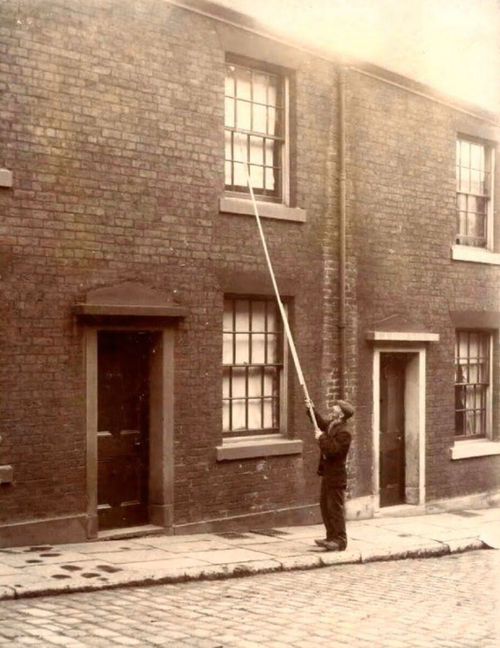 My mum remembers knocker uppers in Stockport, Cheshire in the 1930s. My husband's dad, a Canadian, was posted in England in the army during the Second World War, and started dating a pretty young British girl (who later became my husband's mum). One time, after an evening out, Olive said to Ken, "Come knock me up in the morning." His jaw dropped, along with those of all his envious friends. I can't quite decide if it's a sign of dedicated loyalty or a need of more hobbies that I immediately remembered your similar post from March 2010. I had half-remembered it, but it didn't show up when I used the Lijit search box (which does sometimes miss things). An old man who started work on the railway in Swindon in the 1950s told me that 'not long before he started there had still been knocker-uppers'. Apparently some of them, seemingly none too professional, would throw small stones at upper floor windows.